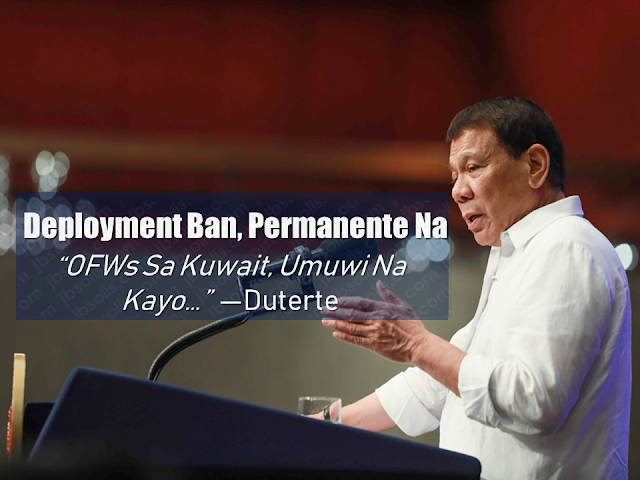 President Rodrigo Duterte said that the deployment ban of overseas Filipino workers to Kuwait, especially domestic helpers, would be permanent. "There will be no more recruitment... especially domestic helpers," said Duterte. 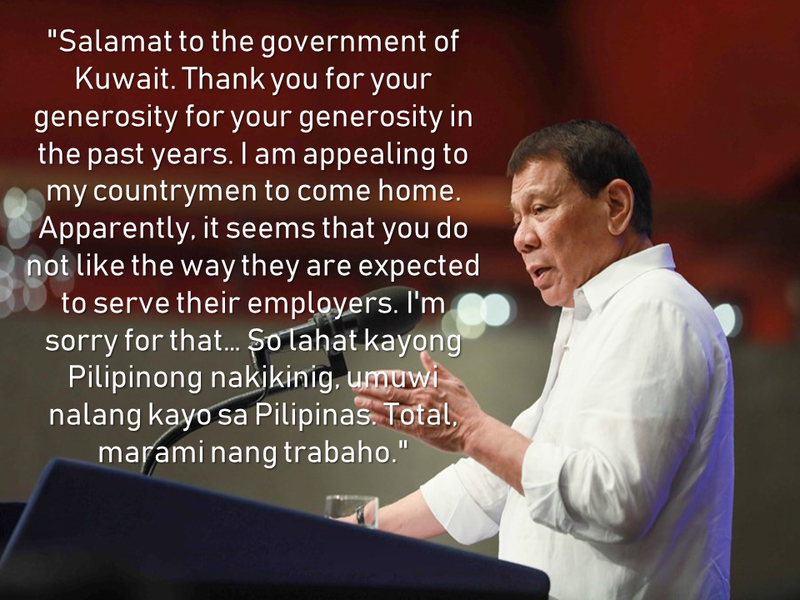 The president also urged every Filipino skilled workers in Kuwait to come home, as jobs would be available for them in the country. China is considered among the possible future deployment destinations, workers could look forward to, where some 100,000 English teachers would be needed in the next five years. There would also be a need for caregivers in countries with aging populations, with Duterte pointing to Japan as one of these possible destination countries. Furthermore, the president said that the Philippines would need workers because of the bullish economy, and because of the government's "Build, Build, Build" infrastructure program. 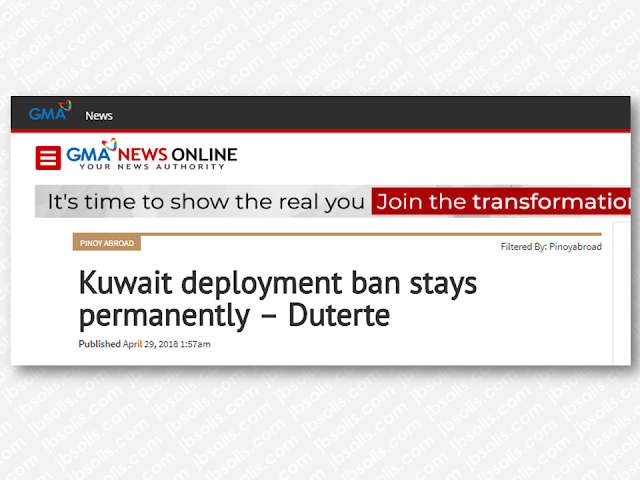 As he made an appeal to Kuwait OFWs' sense of patriotism, the President said, "please come home." Nevertheless, Duterte conceded that things would initially be difficult for returning workers, but matters would "straighten out" eventually. According to the Foreign Affairs Department, there were 260,000 Filipinos working in Kuwait, with more than 65 percent of the domestic helpers. However, The president expressed much gratitude to Kuwait for the help it provided to OFWs. He also reiterated that he had no ill will towards the Kuwaiti government, neither with its people. Nonetheless, he hoped that the Filipino workers who chose to remain in Kuwait would be treated humanely. Meanwhile, Labor Secretary Silvestre Bello III said that the president's statement was misquoted and reports are sometimes inaccurate. The President reportedly said that the ban is now permanent -- that is not the case, he said. The President had said from the start that the deployment ban will stay for as long as there is no MOU and there is no justice. Secretary Bello also said that he will still clarify the issue with the president.